In this definitive guide to Walt Disney's live-action output, Dr. John West explores an often overlooked but important chapter in Disney cinematic history: the live-action films and television shows released by the Disney studio during Walt's lifetime. From blockbuster movies like 20,000 Leagues Under the Sea, Mary Poppins, and Treasure Island to such lesser-known efforts as Savage Sam and Monkeys, Go Home!, West describes the production of each film in detail, with backstage stories and complete cast and crew information. The small screen output of the Disney studio is given similar treatment: over 70 episodes of Zorro, Texas John Slaughter, Davy Crockett, and other TV series are described and catalogued, along with in-depth analyses of the shows themselves. Plus, the book features over 80 photos, many of them never seen before, including candid shots of Walt Disney in his office. 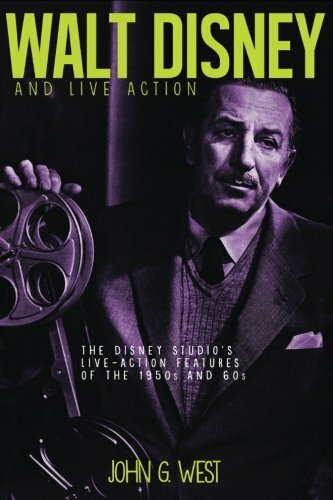 In addition to his detailed coverage of Disney's live-action films and TV shows, West devotes several chapters to a fast-moving but comprehensive history of the Disney studio's live-action productions, from the producers, directors, writers, composers, and set directors involved to the meanings behind Walt's live-action films and the values he sought to impart on American culture.